Galway City Council has voted to revoke a resolution giving the Freedom of the City to Aung San Suu Kyi. The Myanmar leader has been accused of perpetuating human rights abuses by not speaking out about violence against the Rohingya Muslim minority. She was awarded the Freedom of Galway following a unanimous vote by city councillors in 2005. The honour was granted in recognition of the work the Nobel laureate carried out for peace and democracy. While she was not able to personally accept the award, it was received by a relative on her behalf. However, members of the Rohingya Action Ireland group have been lobbying for the award to be rescinded, in light of the ongoing concerns over the treatment and displacement of thousands of people in recent years. While there is no provision in local government legislation to remove the award from a recipient, councillors have power to revoke the resolution to grant the Freedom of the City in the first place. At this afternoon's council meeting, 13 members voted to do just that. Fine Gael Councillor Frank Fahy said he did not think rescinding the Freedom of the City would make "a blind bit of difference" to Ms Suu Kyi, who he said would have difficulty finding Galway on a map of the world. Independent Councillor Collette Connolly wondered if the council should review the entire list of people who have been granted the honour since the foundation of the State. She raised concerns about the decision to give former US President, Ronald Regan the Freedom of Galway in 1984. Mayor Niall McNeilis said removing the Freedom of the City would be a new step for the local authority to take but he said the move would show solidarity with the Rohingya people. Campaigners say over 6,000 members of the Rohingya minority have been killed and several hundred thousand others displaced, as a direct result of the actions of the Myanmar military. They have been critical of what they describe as Ms Suu Kyi's failure to intervene, to safeguard the welfare and lives of those at risk. 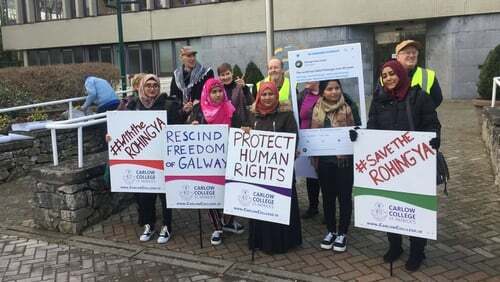 Hichael Mansor, of the Rohingya Action Ireland organisation, said the council vote sent a message to the world that human rights abuses would not be feted or tolerated by the people of Galway. While acknowledging that the personal impact on Ms Suu Kyi might be negligible, he said the combined result of such sanctions showed that the international community was monitoring events and registering its disapproval.